King’s Lynn had two main munitions factories during World War 1. To the north His Majesty’s Factory on the Alexandra Dock and Cooper Roller Bearings to the south. Savages had also converted their ironworks for war work in the manufacture of aeroplanes. 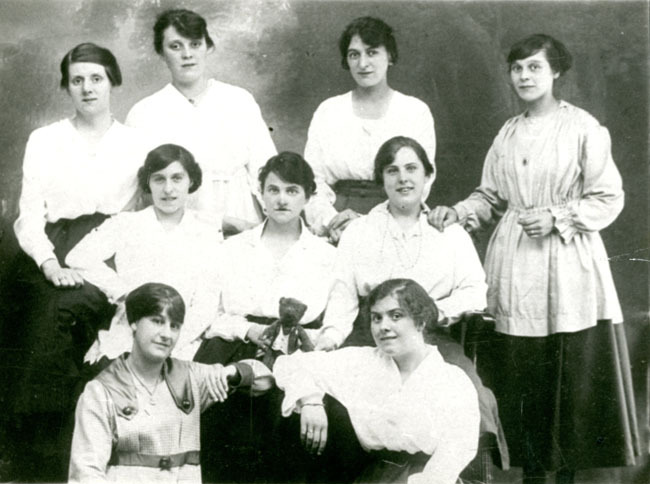 With men at the Front these factories employed a large number of women known colloquially as Munitionettes or Canary Girls. By the end of the war 80% of the munitions workforce were women. There were 4,285 controlled factories and 103 state ones. We [at True’s Yard] are fortunate to have a picture of four King’s Lynn Munitionettes- Molly Dowdy, Violet Taylor, Lily Carr and Agnes Warnes. The image was featured in the Lynn News. They were employed by Cooper Roller Bearings in the production of the new 20lb and 25lb aerial bombs. They also worked on a new fuse designed by Thomas Cooper. 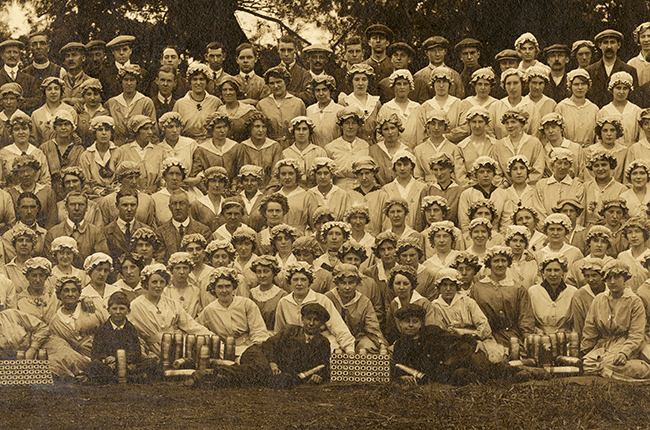 What it was like to work in a Munitions factory? The devil’s porridge was cordite, a smokeless propellant used for shelling. It was made up of nitric and sulphuric acids, nitro-glycerine, gun cotton, acetone, mineral jelly, alcohol and ether. Some 258 million shells were used by the British Army and Royal Navy during the war. Such was the risk of accidental explosion the workers would be strip searched upon entering the factories for anything that could cause friction. Hairpins, bras with metal clasps and silk stockings were all banned. Fines were imposed for anyone who breached these rules. Such was the pervasiveness that even some babies born to munitions workers were born bright yellow. Unfortunately repeated exposure to TNT could result in a form of toxic jaundice and 100 fatal cases were reported. Poor conditions had to be accepted as strikes were banned and any fatalities covered up for the sake of morale. There was a severe shortage of acetone during the war, as mentioned one of the components of cordite. At its worse the guns were limited to firing only four times a day. This meant the soldiers going over the top had hardly any protection at all. Chaim Weizmann, a renowned bio-chemist discovered you could distil acetone from horse chestnuts, maize and potatoes. His Majesty’s Factory at the Alexandra Dock was converted for this process. By 1917 the Ministry of Munitions launched an appeal for the collection of horse chestnuts. 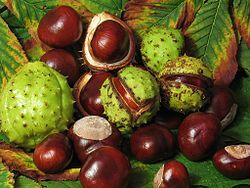 The humble conker was collected by school children and even the Queen Consort Mary commanded her staff at Sandringham, which has a particularly plentiful supply, to help the war effort. Vast quantities were collected, the children having no idea exactly how they were helping the war effort. 3,000 tons made it to His Majesty’s Factory to be converted. From letters to The Times we known that more were collected, unfortunately poor transport links meant many piles of chestnuts lay uselessly rotting at railway stations. This entry was posted in Art Exhibition, Arts projects, research project and tagged factories, King's Lynn, munitions, Scars of War, We Will Remember Them, women at war. Bookmark the permalink.